In stock -This product will ship today if ordered within the next 10 hours and 6 minutes. 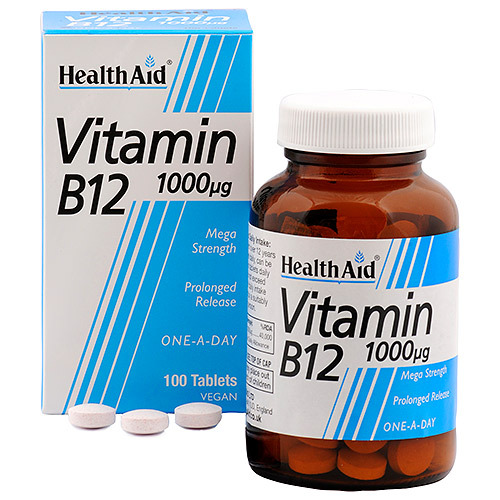 HealthAid Vitamin B12 is utilised in the formation of healthy red blood cells, maintenance of the nervous system and proper metabolism of fats, carbohydrates and proteins. A daily B12 supplement is well advised for vegetarians and vegans, as this vitamin is normally lacking in vegetarian diets. Bulking Agent, [microcrystalline cellulose, hydroxy propyl methyl cellulose (HPMC), di-calcium phosphate], Anti-caking Agent (silica, vegetable magnesium stearate), Capsule Shell [glazing agent (HPMC, glycerine)] Vitamin, B12 (cyanocobalamin). Children 3 to 12 years of age, take 1 tablet daily. Adults and children over 12 years of age, take 1 tablet daily, can be increased up to 2 tablets daily if required. Do not exceed the recommended daily intake unless advised by a suitably qualified person. Below are reviews of HealthAid Vitamin B12 - 50 Vegan Tablets by bodykind customers. If you have tried this product we'd love to hear what you think so please leave a review. 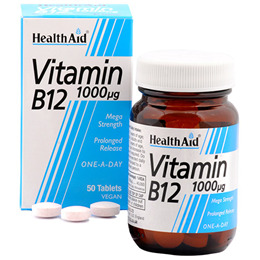 HealthAid Vitamin B12 is utilised in the formation of healthy red blood cells, maintenance of the nervous system and proper metabolism of fats, carbohydrates and proteins. A daily B12 supplement is well advised for vegetarians and vegans.